The book is based on Dr. Schussler’s theory of 12-tissue remedies. It gives in fairly good details, all the relevant facts about each tissue remedy, symptomatology, drug affinity, inimical and compatible remedies, modalities’ comparison with some homeopathic symptoms so that the reader can know, at the outset, what the salient features of a remedy are. It will save his time and energy in choosing the most suitable remedy to treat a patient. 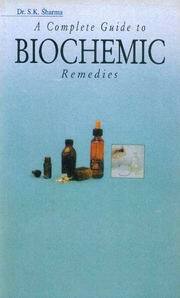 It also contains a chapter on biochemic combinations which form an essential and indisputable part of homeopathic remedies and a separate chapter on preventive medicines which will help a person to take pre-emptive steps to ward off an impending or suspected invasion of an infection. The book is very useful for the benefit of common man so that he could get rid himself of the diseases that frequently affect him.